Recently I finished up another hand repair of a well-loved quilt. I really enjoy doing this, and love having people bring me these quilts. This was Donna’s daughter’s quilt when she was a baby, and now the daughter was becoming a mother. Donna wanted the quilt repaired so that her new grand-baby could cuddle with it too. There were several larger tears in this vintage quilt, including this one that was just not going to take kindly to being repaired. This tear was in four directions from a center hole. So, I had to get a bit creative this time. I ironed down the tears with a bit of very light fusible web just to hold them in place. 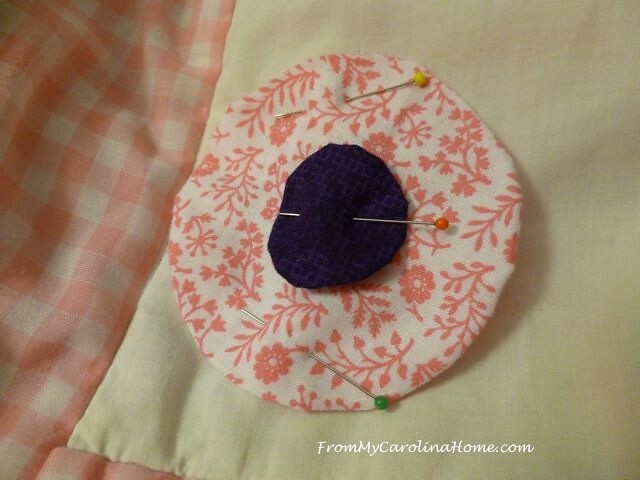 Then, I made a yo-yo from a pink print to make a flower applique large enough to go over the entire area of damage. 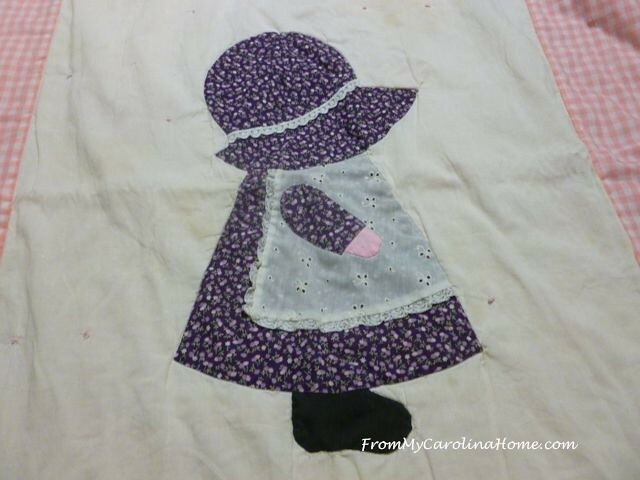 I pinned it into place with a dark purple center to go with the dress on the Sunbonnet Sue main appliqué. I stitched both down by hand. But, that dark center kept drawing my eye to it, when I wanted it to just be an accent to the main motif. So, I frogged off the dark purple and replaced it with a lighter purple, fussy cut flower. 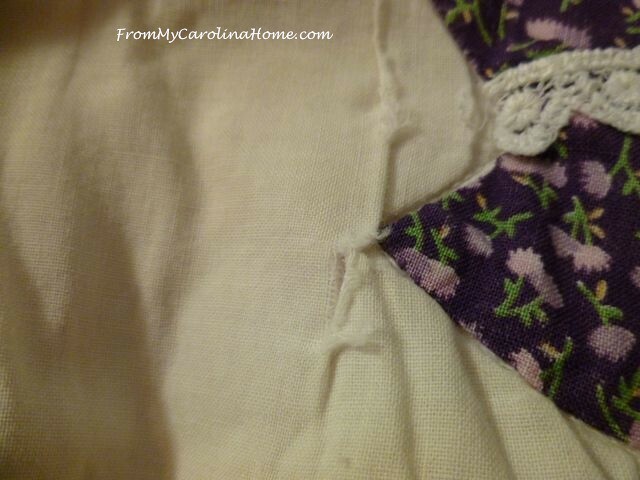 Around the main appliqué, some hand stitching was needed to close up the gaps and small tears. After using a light fusible web on the longer tear in the background here, there was enough extra bulk in the background to make hand stitching with an over-whip possible. Because the quilt is tied and not quilted, there was fabric to move around a bit. You can see the seam here, but that is better than a tear, and should hold up to at least moderate use. A few more stitches around the appliqué and that part was done. The pink border was pulling up from the white background in spots, so all those areas were hand stitched back in place. All done, and didn’t take that long. I finished the repairs in about 3 hours. 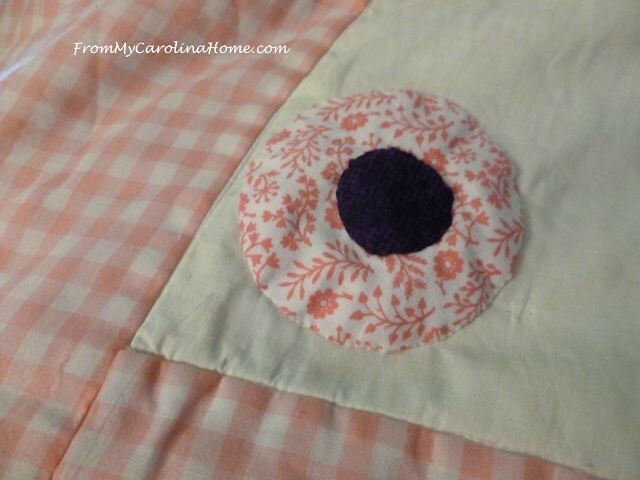 Now the little flower appliqué is a cute accent and the focus is the Sunbonnet Sue. I had to applaud her for wanting to pass on such a piece of living memory. 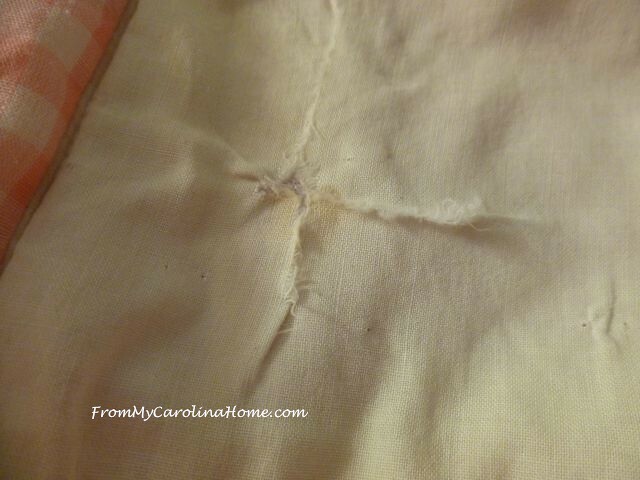 For me, this is the true measure of how much a quilt is valued, to be worn out and repaired to wear out again. This has to be the highest complement any quilter can get! If you are local and have a well loved quilt needing repair, my rates are very reasonable, and are charged by the hour. I am also willing to do quilts mailed in, if you are willing to pay the postage both ways. 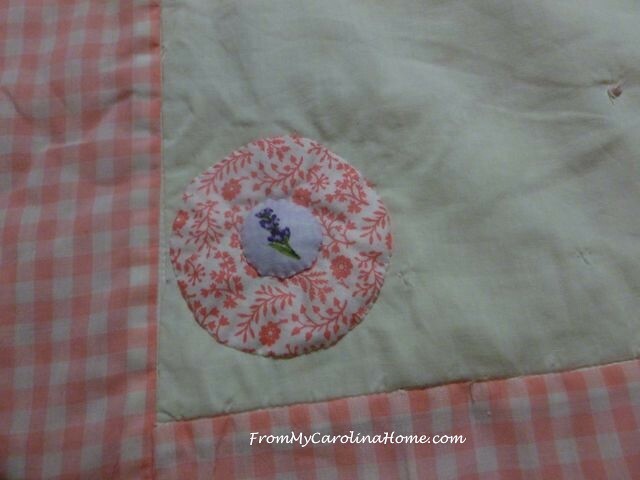 Just send me an email at frommycarolinahome at gmail dot com and let me know what you need. 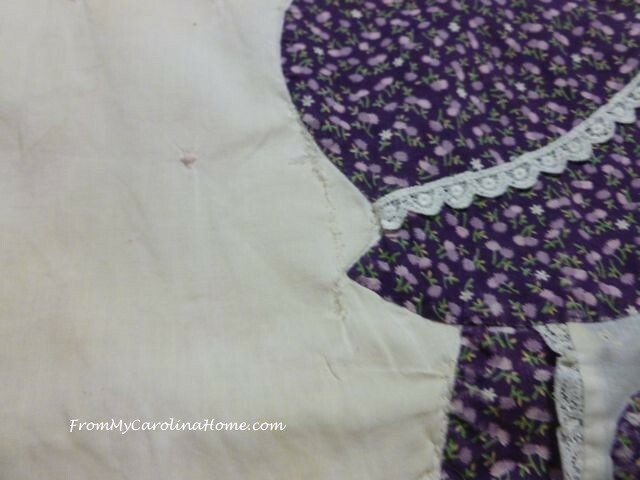 Also, I have done posts on how I do repairs which you can read about in Repairing an Old Damaged Quilt and in Applique Quilt Repair if you would like some tips on repairing your own quilts. Do you have a well loved fabric memory? Hot nowadays that sounds like a great project to start on. Still working on my flowers and changing my patio around for now. Good job on the repairs – ready to be loved again! I do like the light flower center much better. I have a SBS quilt that my cousin’s grandmother made for her and then was handed down to my mother for me. I’m just waiting for one of her sons to have a baby do I can clean it up, put on a new binding and pass on. Fantastic work. It is kind of like surgery, isn’t it? I remember when I was working for those ortho surgeons, I did go back to school to get other premed out of the way and possibly become an ortho surgeon. Yes, that lasted about two years, then my life kind of changed direction. I think your surgical skills are excellent. I have an old quilt that was given to my parents by the ladies of the churches in my Dad’s first charge. They cherished that quilt, and it has a few tears that need repaired. My plan is to attempt the repairs myself, but I’ve been waiting till winter when things aren’t so busy around here. I hope I can repair it as well as you have done on your quilts! The yo yo flower is perfect, and the pinks look exactly right together too! I am fortunate to have a single bed quilt that my great grandma hand pieces and hand quilted when she was very old. I put it on the bed for summer company, and I love just looking at the fabrics knowing they were scraps from dresses and pajamas of hers and the family. 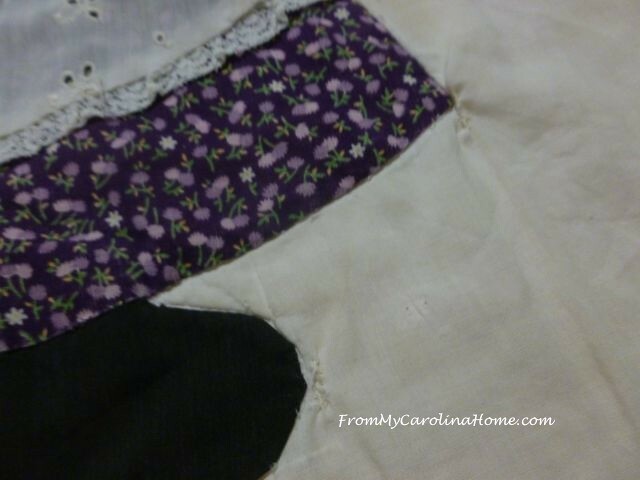 Somewhere in the house I have a Sunbonnet quilt made for my daughter by my mother’s friend. I should look for it and display it. It may not have been done well, but there was a lot of love in it. It should be in excellent shape, since it was washed only once or twice. I never thought of getting it out for our grandsons. Hello Carole! This is a darling quilt and I can understand wanting to pass it on. I have saved several of my Daughter’s quilts that were made for her from both of her Great Grandmothers and one from her Grandma and Great Grandma. Only, I do not believe my Daughter will ever have children, yet I still hold onto them hoping. I like that you changed the dark center to the lighter center also, the lighter one does blend the extra applique into looking perfectly normal. That does not quite sound right, but I hope you know it is a compliment meant for you! Thank you for sharing all of your great advice on fixing repairs, it helps to encourage us to try it and be happy with the success! Have a great day! I just love yo yos! I’d have probably scattered a few more around that quilt, since one is never enough for me!! Different subject: Remember the card making group I told you about? Today was their monthly meeting, & I am on creativity overload! Had made some cards for you . . . but wasn’t satisfied with one & just hated to send one I didn’t like! Asked the gals what they would do, & a couple said – tear it apart if you don’t like it, & use the parts for something else! So I did. AND the group has a habit of bringing their stuff – punches, stamps, papers, gizmos. . . & putting it on the table for anyone to take – a basket nearby is for donation, which they give to the Fire Dept. where we have the meetings. Win Win Win! I got some punch shapes & fancy paper I’ve been craving. Excellent repair work. 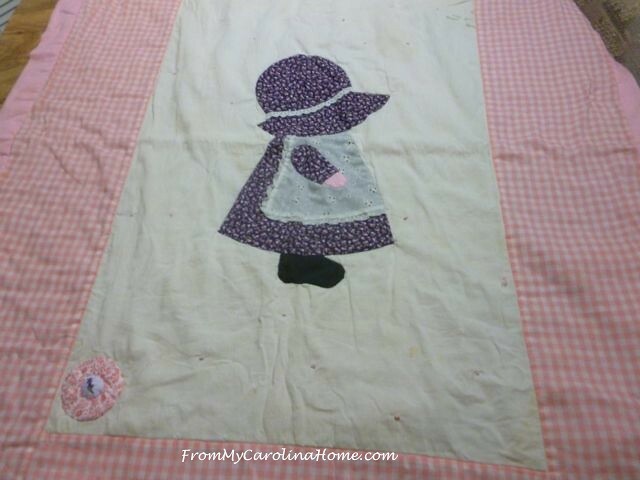 I love Sunbonnet Sue quilts. The family will love being able to hand this quilt down. Your repairs are wonderful. The yo-yo flower was a great idea. How wonderful to be part of something that rescues a torn quilt to be used again. What a sweet quilt it is, too.